I love bite sized pieces of chicken for easy appetizers. They are easy to put on a skewer and this makes dipping really easy. 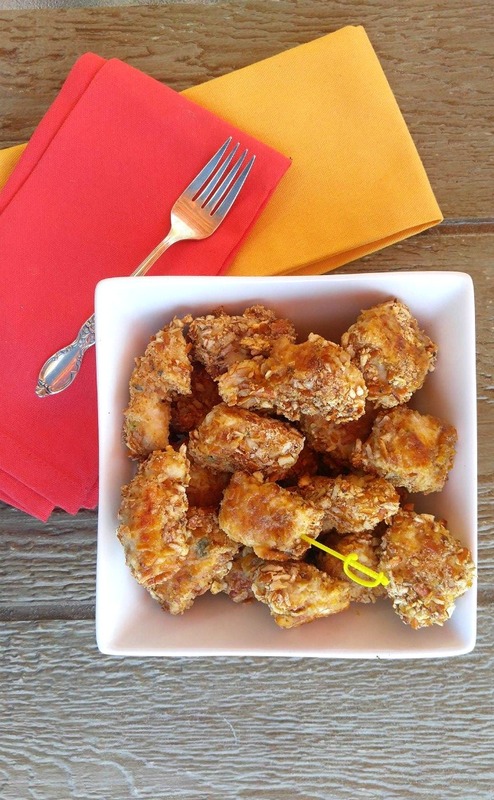 These Pretzel Crusted Chicken Tenders are a great party appetizer but the family will love them for a main course, too! I recently saw a recipe for pretzel crusted chicken breasts on Rachel Ray. “Why not do this with small pieces of chicken, I thought?” What I love most about these little bites is that the center is moist and tender, but the outside has a nice little crunchy thing going on. Can we say YUM? This recipe is also one of my favorite 30 minute meals. It’s quick, easy and super tasty! 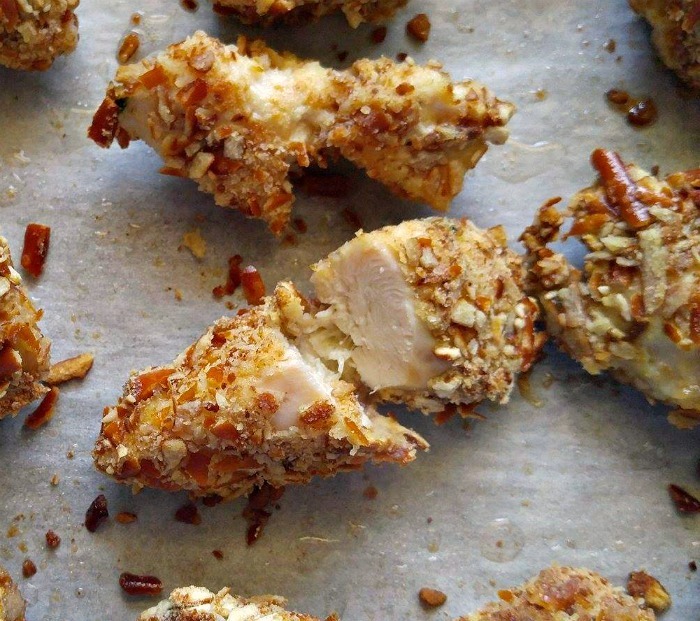 Baking these Pretzel Chicken Tenders in the oven saves a lot of calorie over deep frying them. A spray of coconut oil allows the coating to brown nicely and you won’t miss the extra fat at all. The lack of oil also lets the flavor of the pretzel shine through. I used a heavy rolling pin to crush my pretzels. I just put them into a zip lock and went to town on them. In a few seconds, I had crushed pretzels just ready for my dipping station. Coating the chicken is done in three steps. First, I rolled the chicken tenders in some seasoned flour. I used both fresh thyme and basil as well as sea salt and black pepper for the seasonings. Next, into the egg it went and finally, the whole thing got rolled in pretzels. All these layers really add to the crunchy outside, and in my house, crunch is KING! COOKING TIP: use two hands for the dipping procedure or you will have a mess. Use your left hand to roll in flour and dip in the egg, and drop them into the pretzels and use the right hand to roll. Believe me, it will be much less messy! I used a coconut oil baking spray. It saves so many calories on oil and gives the finished chicken tenders a lovely crunchy texture. Just flip them half way through cooking for best results and spray again. 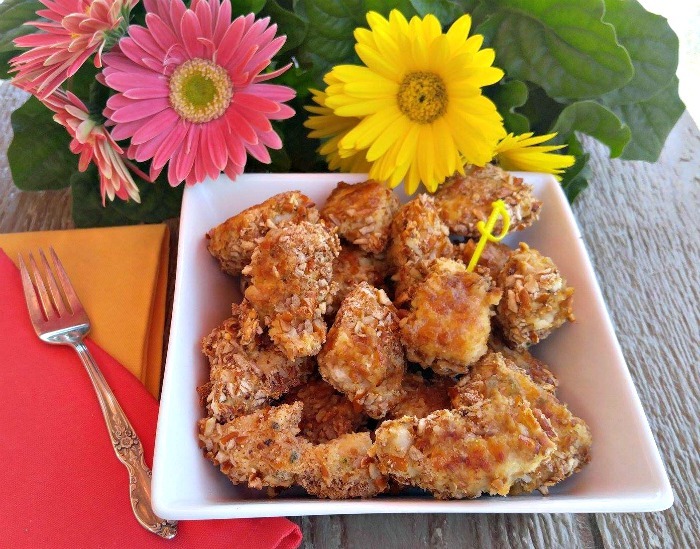 The inside of these Pretzel crusted chicken tenders is so unbelievably moist and tender. 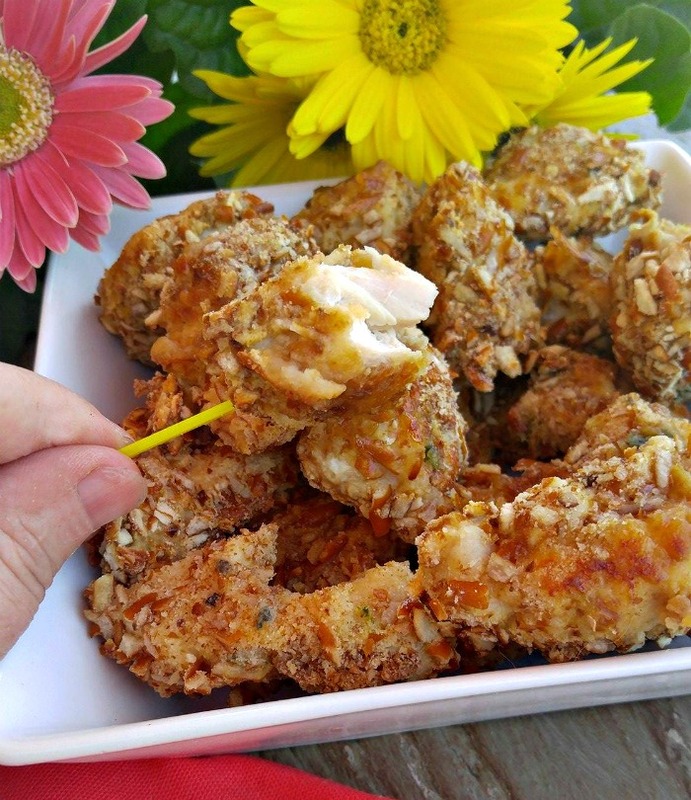 Every bite of these delicious Pretzel crusted Chicken Tenders has a juicy center and loads of crunchy pretzel coating. The crunch is what makes these such a hit at parties. We know that all kids love chicken nuggets. These home made pretzel crusted chicken tenders add a crunchy pretzel coating and the kids will be asking for you to make them again tonight. And we don’t have to tell them that these are a healthier version of their favorite. Promise! These Pretzel crusted chicken tenders make a great main course, fun lunch and fantastic BBQ party appetizer. They will be gone in seconds! Serve these delicious bites with a home made dipping sauce, or some bottled ranch (or my home made ranch dressing) or honey mustard dressing. 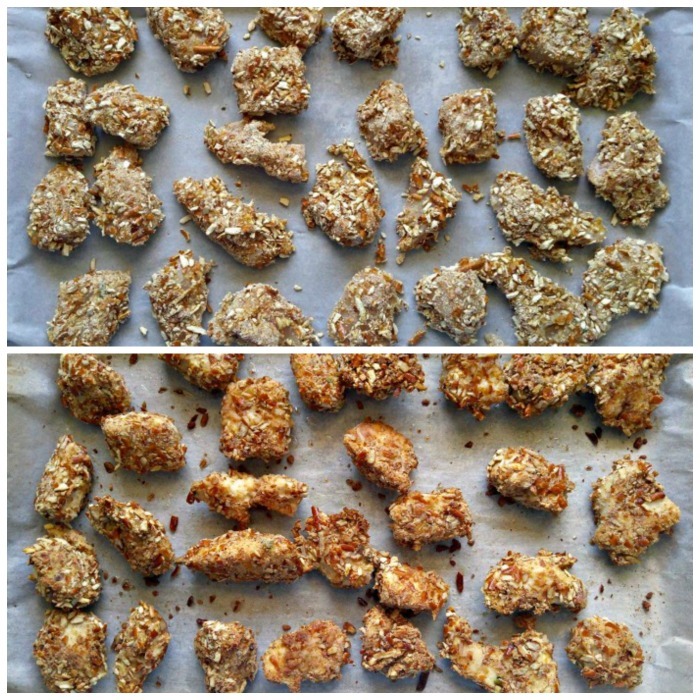 Once you have made your own chicken nuggets, you will never want to eat fast food nuggets again. They are THAT GOOD! Preheat the oven to 400°F. Line a large baking sheet with a silicone baking mat or parchment paper. Cut the chicken tenders into 1 1/2 inch pieces. Combine the flour, salt, and pepper and fresh herbs in a shallow dish. Beat eggs in another dish and place the crushed pretzels into a third dish. This will be your dipping station. Coat each chicken piece in the flour, shaking off any excess, then dip into the egg. 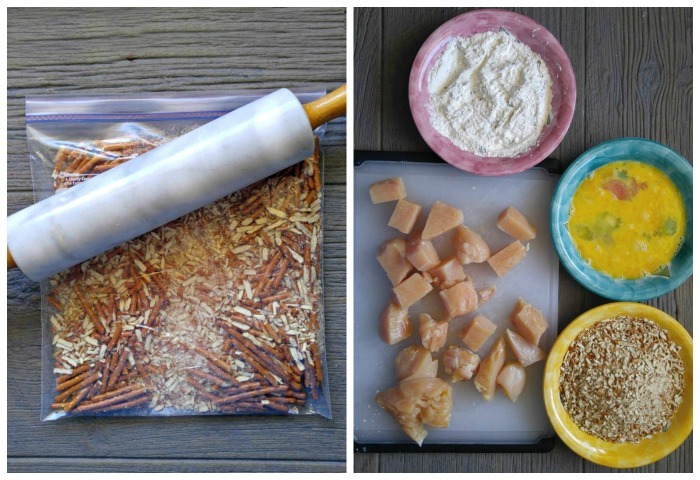 Finally, roll in the pretzels, shaking off any excess. Place the chicken bites on the prepared baking sheet. Lightly spray each with nonstick spray. This will let the breading brown slightly when you bake it. Bake in the preheated oven for 8 minutes. Flip over each piece, spray again,and continue baking until the outside is crisp and the centers are cooked through, about 6-8 minutes more. Be sure the chicken is cooked through. 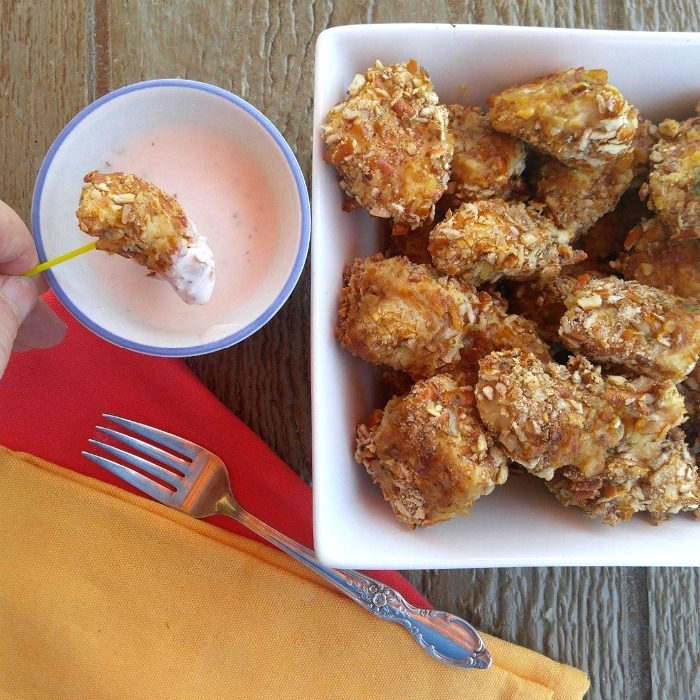 Serve chicken bites with toothpicks (if using as an appetizer), with ranch or honey mustard dressing.